Fortnite: Save the World can be a sea of confusion for beginners. 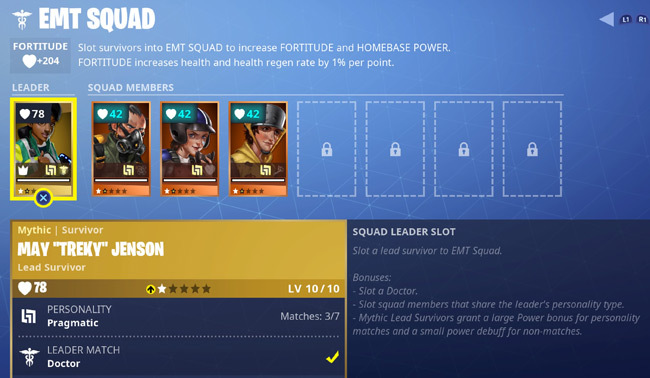 One of the strangest things about Save the World is how important Survivors are to your Hero’s overall strength and Power Level. In most video games, your Heroes get stronger by leveling them up – and maybe by unlocking some skills in their skill trees. Those are both true in Fortnite: Save the World, but they only account for a small portion of your Hero’s statistics. A huge portion of your Hero’s statistics and Power Level comes from your Survivors! You use your Survivors to Level Up! You need to start thinking of your Survivors as an important part of your Hero Team – They are the people behind the scenes that are really helping you out: Like Lucius Fox to Batman; Like Felicity to Arrow; Like Cisco to The Flash; Like J.A.R.V.I.S. to Iron Man. You are a lot stronger with their assistance. 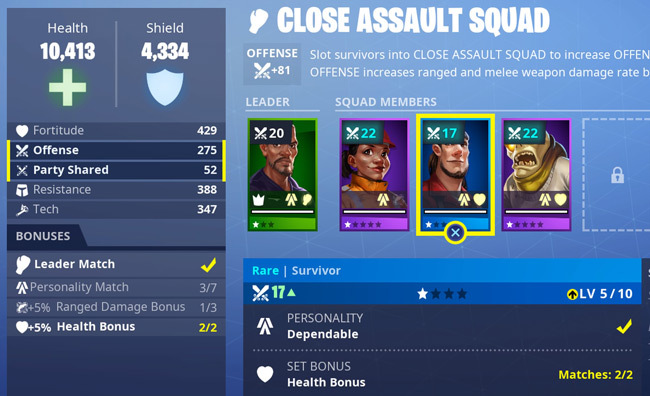 Survivors can make up 65-80% of your Hero’s stats! About 65 – 80% of your FORT comes from your Survivor Squads. So your FORT is extremely important! Each squad has room for 8 team members – 1 Leader and 7 Squad Members. These slots need to be unlocked individually. And eventually, you will be able to slot 64 total Survivors to make your Heroes a lot stronger. Beginner Tip – Focus on unlocking Survivors Slots! When you first start playing Save the World, you are going to be thinking about your Heroes and your Guns. I know … that’s where the fun is. But if you want to get stronger, you should start focusing on unlocking the Survivor Slots to FORTify your Hero! How do you Unlock Survivor Slots? Unlock Survivors from the Skill Trees! If you look closely at the Skill Trees, there are nodes that will unlock slots in your Survivor Squads. I can’t stress enough how important it is for you to focus on unlocking these. When I first started playing Save the World, I just wanted to make my Soldier’s Offensive Firepower stronger by unlocking nodes that gave me more weapon damage. I saw nodes like: “Unlock Survivor Squad: Scouting Party”, and I thought whoop-de-doo?! But those Survivors add up to be a critical part of Hero’s overall strength! Focus on getting to them! You will get Survivors from doing Missions and by Opening Llamas. Some Reward Missions will award your Lead Survivors as well. 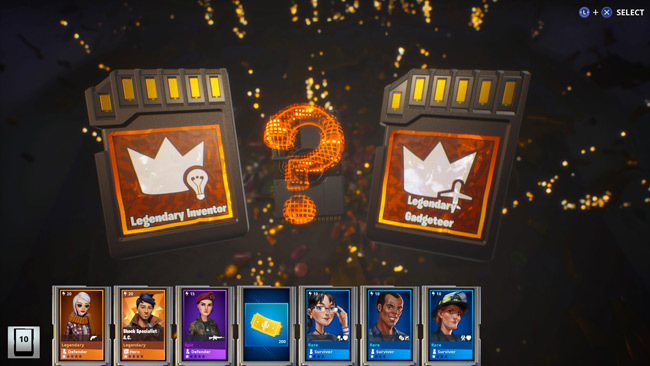 If you are going to get some Llamas for Survivors, wait for: Super People Llamas, Legendary Troll Stash Llamas, and the Legendary Troll Loot Truck Llamas. You want to put your Rarest Lead Survivor into each matching slot and then level them up as you can. So you want to put: your best Lead Doctor in the EMT Squad; your best Lead Inventor into the Think Tank; etc. When you first start playing, you might not have a match for every lead survivor job, so just put an unmatched lead survivor there until you get a match. I remember I had the hardest time find a Lead Martial Artist for my Close Assault Squad – I am still using a Green/Uncommon because I haven’t found anyone better. Now that you have a Lead Survivor in place, it’s time to fill out the rest of your Squad. But don’t use just anyone. Survivors will get a 25% Bonus Power Boost if they having matching personalities with their Lead Survivor. So, if your best Lead Doctor is Pragmatic, you want to flush out the rest of your EMT Squad with Pragmatic Survivors, if possible. The game makes it relatively easy to find the matching survivors if you look at the symbols on their cards. The number of each personality is Green if the Personality matches, and Red if it doesn’t. In the example below A Level 8 Epic with a Matching Personality is more Powerful than a Level 10 Legendary. If you don’t have enough survivors of the matching personality, just put your strongest survivor available until you find a match later on while playing the game. Any survivor will still make your Hero stronger. As a beginner, you will run into cases where it is more beneficial to Slot an unmatched rarer Survivor to make your Hero Stronger. But eventually, as you unlock more survivors, you will want to switch them out with matched Survivors. It can difficult to obtain these bonuses, even near the end-game. It’s almost blind-luck if you get these bonuses. Every time you level up a Survivor, your Hero gets stronger. So keep leveling up those survivors. Survivors need Survivor XP to level up. Do the main storyline and focus on side missions that award Survivor XP. You can also get Survivor XP by transforming people and items in the Armory>Transform section. Here’s a quick guide to using your Survivors to make your heroes stronger. Level Up the Survivors you are using, especially when you get Epics and Legendaries early in the game.